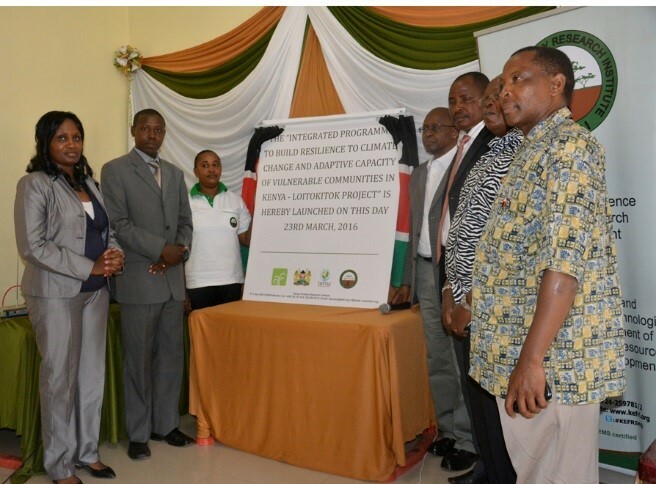 The integrated programme to build resilience to climate change and adaptive capacity of vulnerable communities in Kenya also known as the Kenya Climate Change adaptation programme (KCCAP) was launched by NEMA the National Implementing Entity on 29th January 2016. 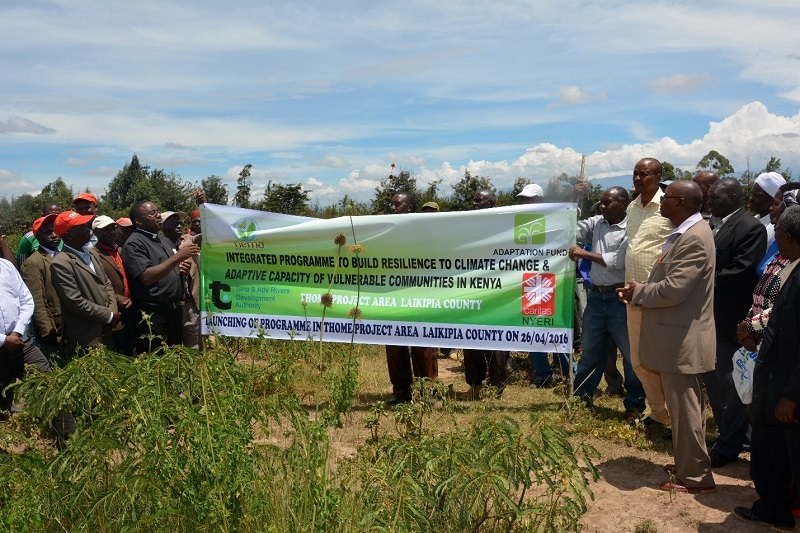 The programme which is funded by Adaptation Fund (AF) is designed to enhance resilience and adaptive capacity to climate change for selected communities in 14 Counties in Kenya, and is designed to respond to effects of Climate Change and will cover sectors like water management, food security, agroforestry, coastal and mangrove ecosystems and disaster risk reduction. Under KCCAP, there are three main executing entities (EEs) namely; Kenya Forestry Research Institute (KEFRI), Tana and Athi River Development Authority (TARDA), and Coastal Development Authority (CDA). The three EEs are partnering with eight other Sub EEs organizations namely, ADRA Kenya, World Vision, Kenya Red Cross, Caritas Nyeri, VIRED International, Horn Aid International, Kenyatta University and NASARU CBO to execute the programme. After the KCCAP launch, regional Inception Workshops are to be held by each Executing Entity as the first activity which marks the initialization of the programme as per the requirements of the adaptation fund. The NIE took up its role of ensuring that funds are disbursed to the respective executing entities as per their first quarter work plans and this has seen various executing entities arrange for their Inception workshop dates. KEFRI, one of the main EEs which has the responsibility of coordinating activities of 4 other sub EEs namely; World Vision, VIRED International, Kenyatta University and NASARU CBO under this Programme, was the first to observe their Inception workshop on 23rd of March 2016. The Entity which will be executing its projects in the sub county of Oloitoktok, Kajiado County is geared towards delivering key climate change resilience output and outcomes under enhancing climate change resilience for improved food security; improving climate resilient water management systems to enhance food security; and strengthening capacity for Programme implementation and climate change adaptation in the sub county. Two of the sub EEs that is NASARU CBO and VIRED International also observed their workshops on 24th May and 9th June 2016 respectively leaving Kenyatta University and World Vision who are yet to set their dates. NASARU whose project site is Lodokilani ward, sub County of Kajiado West has key project deliverables as water harvesting; promotion of drought tolerant crops and irrigation of agriculture around dams; awareness creation and capacity building on climate change. Similarly, VIRED International has its project focusing on minimizing impacts of climate change in an effort to promote food security and thus improve community livelihoods in Nyando Basin, Kisumu County. Tana & Athi River Development Authority (TARDA’s) Inception Workshop was observed on 26th May 2016 at TARDA’s main boardroom in Nairobi with representatives from county commissioner, county director of environment, ministry representatives at the county level, and community members in attendance. TARDA has spread its arm by showing commitment and contribution towards creating resilience in the Eastern region cutting across Machakos, Makueni, Kitui, Embu, Nyeri and Murang’a Counties. TARDA has a role of coordinating and supervising activities for other sub-executing entities namely Caritas Nyeri, Kenya Red Cross, Horn Aid Kenya and ADRA Kenya. Similarly, Horn Aid, Caritas Nyeri and ADRA Kenya observed their workshops on 6th, 25th April and 9th June in Garrissa, Nyeri and Kitui respectively. The organizations projects thrives to support and build the capacities of communities in the targeted Counties in adapting to long term climatic changes and fragile ecosystems as well as developing and implementing integrated adaptive mechanisms to increase community livelihood resilience to climate change. Kenya Red Cross a sub EE under TARDA whose project site is in Waldaa Marsabit is yet to set dates for their workshop. Finally, Coastal Development Authority (CDA) which is another main Executing Entity also observed its inception workshop on 21st June 2016. The Authority’s commitment and contribution towards creating resilience in the Coastal regions is geared towards delivering key climate change resilience outputs and outcomes that are not limited to Implementing Integrated Shoreline and Mangrove Ecosystem Management (ISMEM) plan and establishing appropriate physical assets and infrastructure for water harvesting, storage and irrigation. With only three executing entities left to initialize the process, the Adaptation Fund Programme has seriously taken its roots in 8 Counties with the existence of requisite capacities of the executing entities living the targeted communities highly expectant and ready to achieve the desired outcomes and aspirations.